Jumper One returns to the Stargate on final approach, after having suffered an attack from several remaining Wraith on their homeworld. Major Sheppard is in critical condition, having been bitten in the neck by a paralyzing insect that refuses to let go. After opening the gate to Atlantis, Jumper One begins to make its way through the event horizon, but becomes lodged mid-way via a damaged starboard drive pod that did not retract. Power is cut inside the ship, and it is imminently clear that the team has 38 minutes to live before the gate automatically shuts down. Jumper One returned to the Wraith homeworld to gain reconnaissance on the species, but when they reached the surface they found the colony to be gone. In its place was an enormous crater, which was not created by an explosion. It is soon surmised that the colony was actually a hive ship that had existed there for so long trees and forest literally grew on top of it. The ship is supposedly now off culling planets and restoring their species to power. Apparently not all Wraith abandoned the planet, as several warriors chased the unit back to the Jumper. Sheppard, however, became lodged in an enormous web where the giant insect bit him and began to disable his immune system. Even a single Wraith warrior was dissuaded from killing him after seeing what had already begun to sap away his life. It was not long before everyone was back aboard the Jumper, and in a hasty retreat the craft’s starboard drive pod was damaged by the Wraith. Sheppard eventually regains consciousness and realizes that the team has not returned to Atlantis. McKay is busy taking readings of the ship. Back on Earth, an Apollo-13-style team has been assembled to try and analyze the problem from their end. Soon their best recommendation is clear: close the jumper’s partition hatch and hope that atmosphere is maintained long enough to send a second jumper and tow them back when the gate finally disconnects, splitting the ship in two. McKay finally manages to close the partition, leaving everyone in the dark. Sheppard is beginning to lose feeling in his arms and legs, as well as patience with Rodney’s mouth. Teyla tries to make John comfortable with a makeshift pillow as his condition worsens. 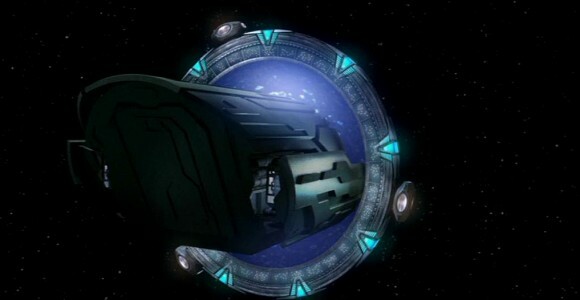 Back at Atlantis, Dr. Zelenka and his team continue to work with a Jumper’s computer pathways in the hopes of triggering (by accident) the appropriate command to close the drive pods. Dr. Kavanagh of the research team is only able to come up with more disturbing problems. If McKay continues to mess with the command pathways it is possible the drive pods could explode and send the end trails flaming back to Atlantis base. Weir is forced to point out, on more than one occasion, that she will not tolerate his attitude of self focus and preservation. Meanwhile, Dr. Zelenka has managed to isolate the drive pod control pathways, the data of which is transmitted to McKay, improving their odds of finding the correct switch from one in a million to one in a thousand. Ford tries several backpack items on the creature attached to Sheppard, hoping it will loosen its grip, but nothing works. Saltwater particularly disturbs it and makes matters worse. For a moment Sheppard is unable to control himself and he violently buffets Ford into the wall of the craft. In shock, McKay accidentally hits the control board, forcing the jumper to slide in further — and thus eliminate the hopes of using the second half of the ship as a lifeboat. Realizing more than ever that they will probably not survive, Sheppard tries to say something personal to Weir, but is interrupted by McKay’s escalating concerns. John begins to devise his own plan to remove the creature from his neck. If it is truly related to the Wraith, once he is dead it will stop feeding. If they cannot resuscitate him then he can go through the event horizon and essentially be preserved in a “deep freeze.” After a short-lived debate, Ford uses the defibrillator and stops Sheppard’s heart. Almost half a minute later the creature detaches. Ford takes it out with his nine millimeter. The defibrillator does not get John’s heart going again, so Teyla takes him through the event horizon. McKay manages to successfully close the drive pods, but with no forward momentum they will not go through the gate. Ford throws his weight into the forward bulkhead, to no avail. With moments before the gate powers down, Kavanagh suggests opening the rear hatch and using the depressurization to push the ship through. Ford forces McKay to go through the gate as well. He depressurizes the ship himself and hangs on to the ceiling as the vessel finally completes its travel through the gate, winding up in Atlantis’ gate room. Ford is administered oxygen and Beckett begins work on the Major. Eventually Sheppard is resurrected. Back in the infirmary, Weir asks him what he was going to say to her — she didn’t want to hear it at the time, but is now curious. He refuses to give her an honest answer, and she concedes to his preference before wishing him a good night. Teyla’s father, Tagan, often told stories of small creatures with equal capabilities to the Wraith (including healing and absorbing life-energy) but she always believed they were just to prevent small children from traveling too far beyond camp. The port side of the Jumper’s rear compartment has control access, enabling such functions as retracting both of the ship’s drive pods. An Atlantis expedition unit’s pack typically includes a swiss army knife, water, matches, an emergency kit, alcohol, iodine and pain killers. The Jumpers have been equipped with supplies from Earth, including as a portable defibrillator, iodine, and salt. VOTE! How would you rate Atlantis's "Thirty Eight Minutes?"